Good evening from Esquire Photography HQ in Orange County everyone! I’m one Newport Beach Wedding Photographer who has a totally exciting to share with you. Over nearly 29 years I have had the honour of capturing quite a few Engagement Shoots, Portraits and Weddings around the world in London, Paris, Berlin and the USA for some absolutely incredible couples. In fact, nearly all the couples I’ve been blessed with along the way have become some really amazing friends that I keep in touch with and even become their family photographer. So that said, I recently was featured on Gayapolis – a website showcasing a great collection of gay friendly businesses – accommodations, wedding vendors, and much more – from our partners at the Purple Roofs Travel Directory, Gay Realty Network, and Purple Unions Wedding Directory. But before you check out the site and the press release and you’re thinking… Hey – I’d really like to get to know this Newport Beach Wedding Photographer (Previously a Huntington Beach Wedding Photographer) that loves to help brides & grooms save time, money & their sanity planning a wedding, totally check out my program; “How To Make The Most Out Of Your Wedding Day” or feel free to contact me anytime. I’m available just about 24/7 via Twitter, Facebook, Google+, the form on my contact page, or the old fashioned phone as well at 888.ESQ.PHTO (888.377.7486) or 562.225.5915. I hope you’re having a great West Coast Wednesday and stay tuned for some amazing events that I’m sharing. From San Diego to Newport Beach, Ventura and all the way up to Oakland – I’ll have some fantastic Weddings and events that I’ve had the honour of photographing – cheers! UBER PS!!! The awesome rock star Client Concierge; Linda & I have been putting something together that is probably one of the BIGGEST THINGS this Newport Beach Wedding Photographer has EVER done in nearly 29 years. I can’t say more yet, but let me just go on record & say – that if you’re getting married & love instant gratification – you will WANT TO KNOW about what Esquire Photography IS DOING! PSS, Check out this awesome quote I shared on Twitter keeping the “Butterfly Effect” moving forward – spreading positivity. It’s a totally new one & I really think it is so very true. “Ability is what you’re capable of doing. Motivation determines what you do. Attitude determines how well you do it.” — Lou Holtz. 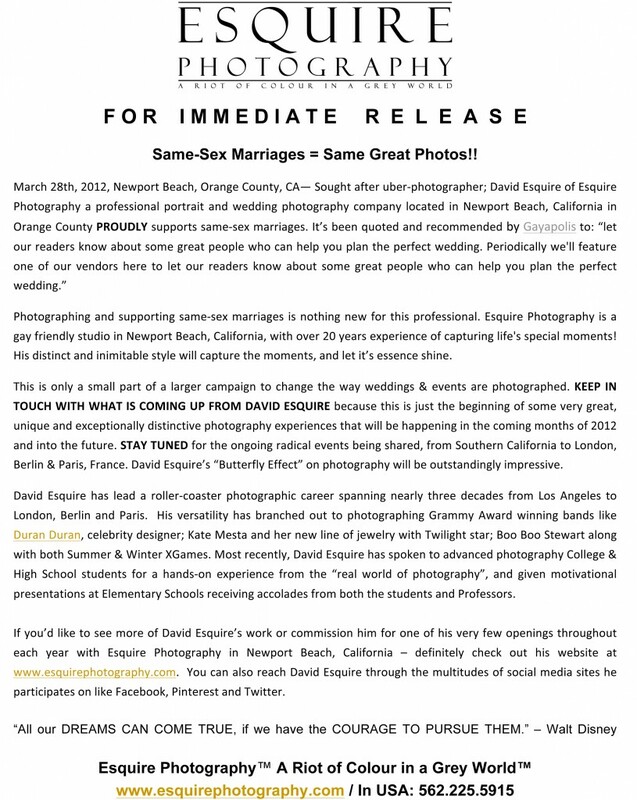 to show some love for Esquire Photography being showcased on Gayapolis!